Last weekend, my brother and sister-in-law began a week-long business trip to Las Vegas. Being only four hours away from El Ciudad de Los Pecados, I made the trip and met them at Hoover Dam, which they had never seen up close. This is indeed an engineering marvel, and even though it tamed the Colorado River, and invoked the eternal wrath of Edward Abbey, is worth being seen by every citizen of Planet Earth. Before getting to the dam, I stopped briefly at one of the Arizona-side inlets of Lake Mead: Temple Bar. Temple Bar was so named for Temple Butte, which in turn was a name bestowed by early Mormon settlers of the Las Vegas area. 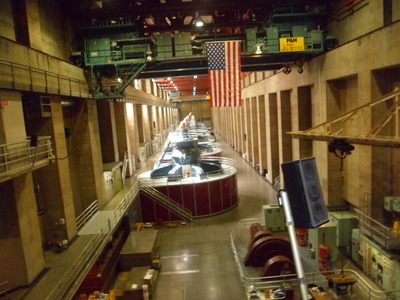 Once at Hoover Dam, I focused on what mattered to my siblings: The Power House. This was my fourth visit to the dam and second time in the Power House. The tour was just as enlightening this time as it was in 1992. 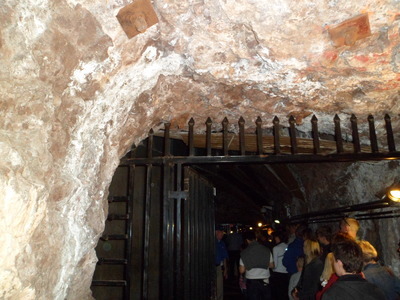 Without the bedrock, there would be no underground generator. My Dad, a turbine engineer, would have been proud of this feat. Being the seeker after nature, I avoided all but the most fleeting, perfunctory contact with the Casino Crowd. The House Floor is merely on the way to Las Vegas’s finer restaurants, and nothing more. 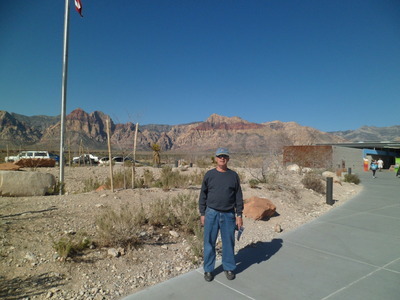 Brother and I had a far nicer time on Sunday morning- at Las Vegas’s signature gem: Red Rock Canyon. 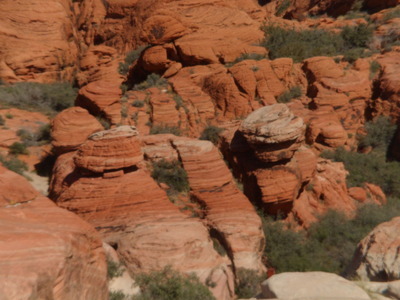 This national recreation area could easily occupy me for a week- and maybe it will, one of these years. Three hours on Palm Sunday, though, was an exquisite first visit. As usual, I was in my element. 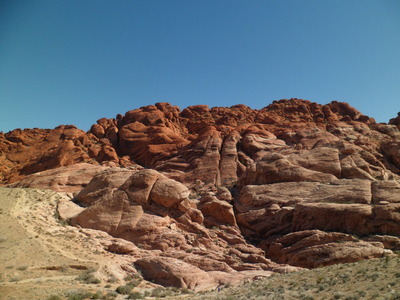 Southern Nevada has plenty of places that can find their way into the heart. 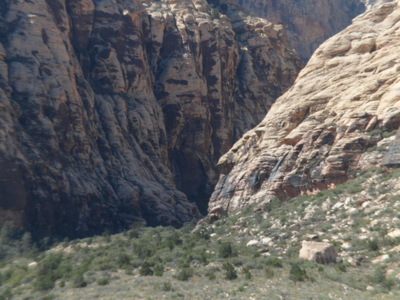 Red Rock Canyon is chief among them. This weekend, it’s time to get back to one of my other favourite nearby haunts: San Diego. 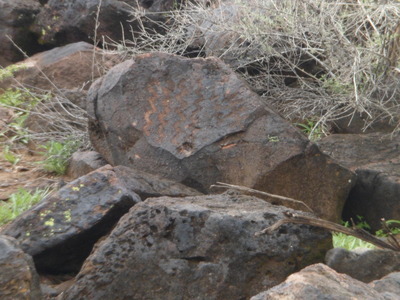 When I recently visited Deer Valley Rock Art Center, in north Phoenix, the docent made several mentions of Hohokam ruins atop Perry Mesa, in Agua Fria National Monument, southeast of our lovely mountain town. 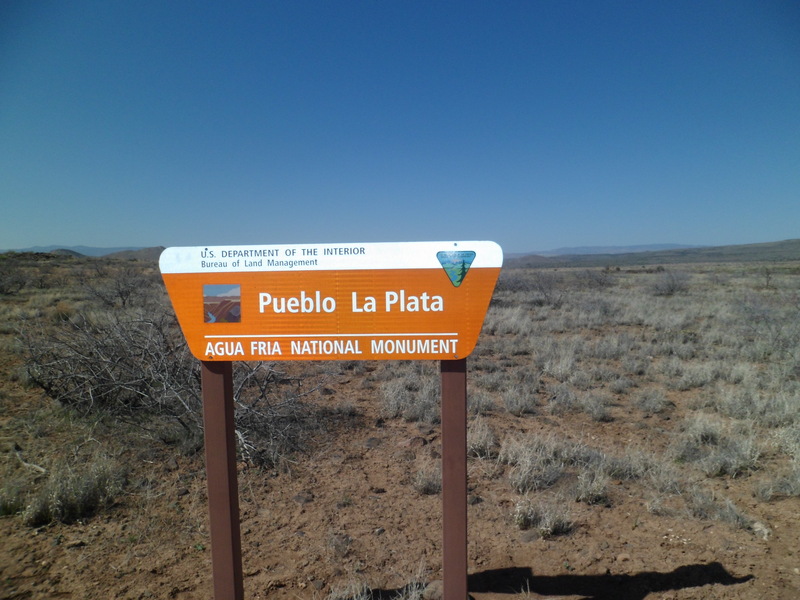 On the way back from my weekend visit to the Valley of the Sun, the urge hit to check out the area most clearly identified by the Bureau of Land Management as having such ruins: Pueblo La Plata. It lies at the business end of a narrow, rocky and rather uninviting switchback, but as luck would have it, the road was dry and the rocks were not jutting up too high for my little Kia to handle. When we got to the top, the scene above greeted us, looking like a stunt double for the Bonneville Salt Flats. I parked Kia Optima off to the side of the road, giving her a chance to get some serious rest. 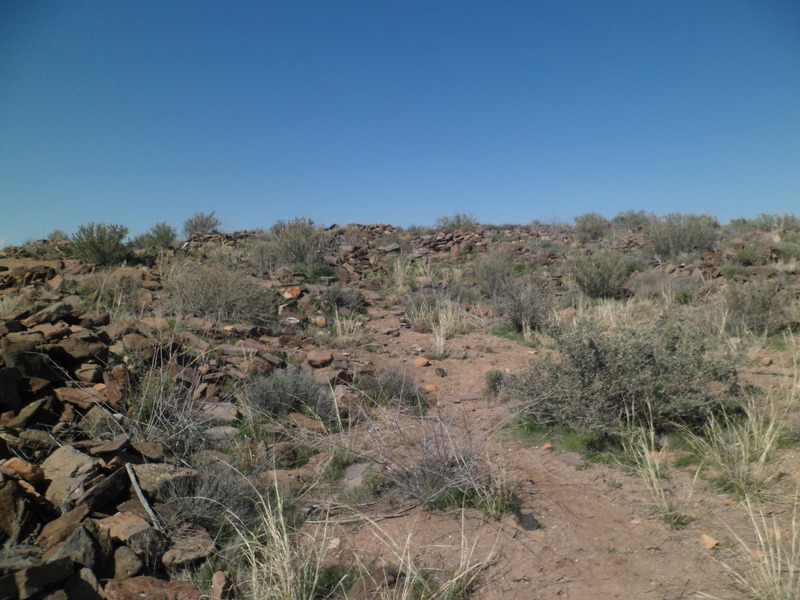 Another 1 1/2 miles of hiking northward brought me to the remote Hohokam site. 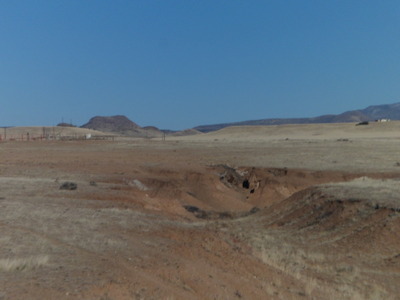 There are 32 “rooms” preserved here, very much indicating that some serious living took place on top of Perry Mesa, long before Perry showed up here. This is the northernmost area settled by the Hohokam alone. 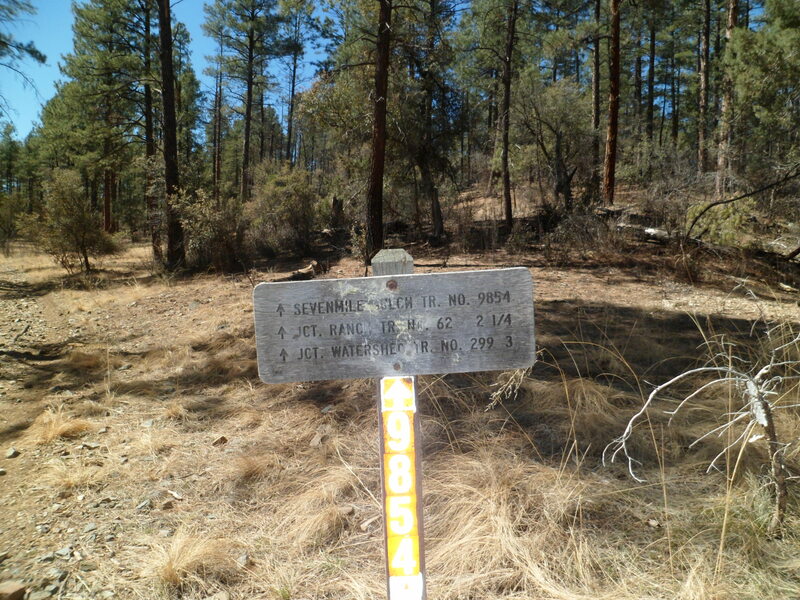 They did visit the areas now occupied by Prescott, Camp Verde and Mayer, but there were other groups there as well. So, Pueblo La Plata, with its proximity to Silver Creek, hosted a sizable community of farmers, traders and hunters. 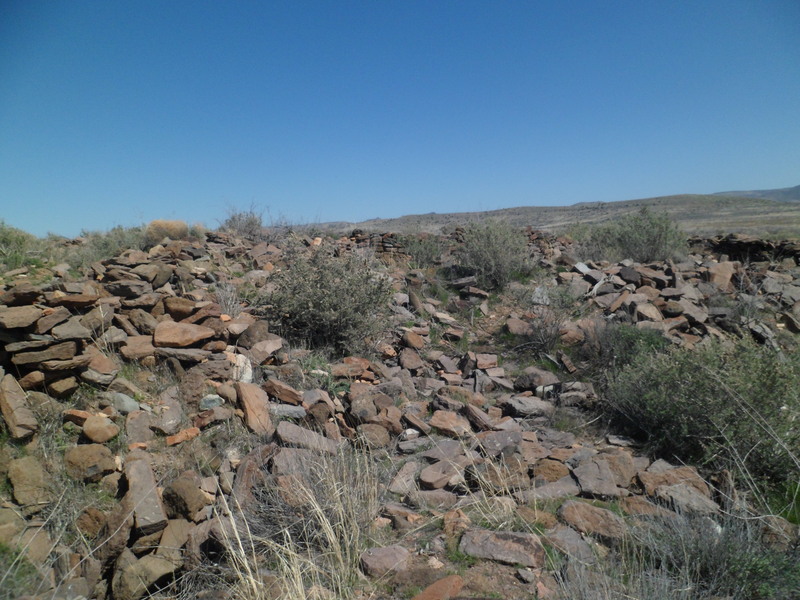 Numerous shards of pottery and arrowheads may be found, in a couple of places arranged on flat rocks, for visitors to see and hopefully not add to their private collections. A ranger was present, while two couples and I were enjoying the views. After about thirty minutes, it was time for me to head back. Kia and I had no trouble going down the grumpy old switchback. You can see an SUV from California likewise made short work of the downhill. 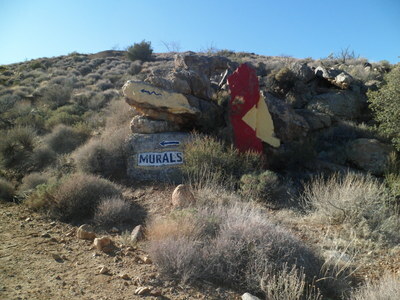 There are other areas of Agua Fria I’d like to visit sometime soon. 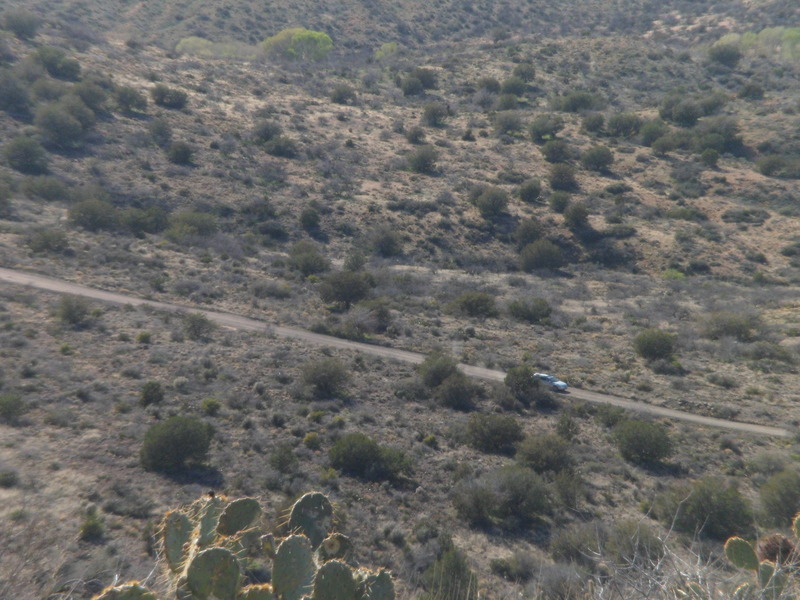 I need Kia for several more journeys though, so next time, I may just park at the foot of the switchback, and pretend Perry Mesa is the South Rim of Grand Canyon. 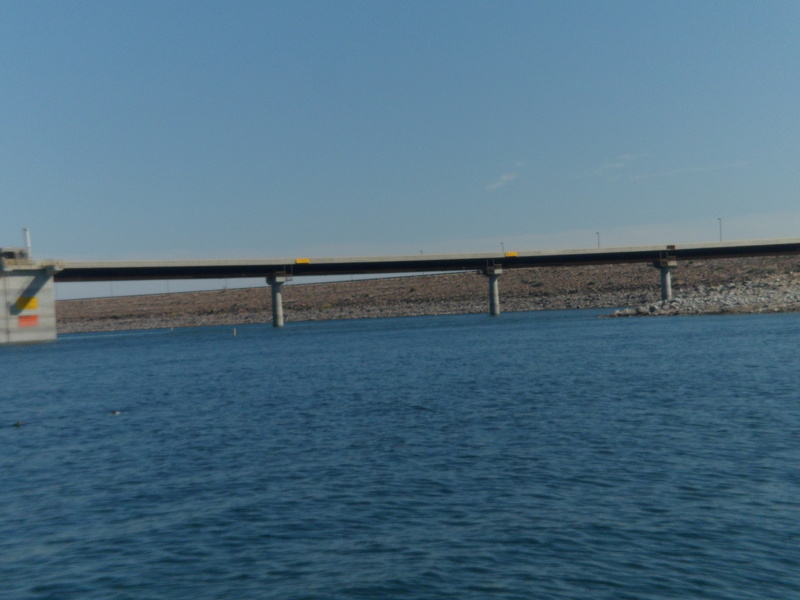 This man-made reservoir, about twenty miles northwest of Phoenix, is the end point of the Agua Fria River. On Saturday afternoon, while I was walking along the southern shore, there were people on boats, people fishing from shore and people sitting in the shallows, enjoying the cool water. 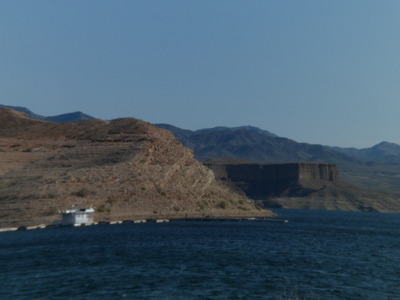 This is what Lake Pleasant, and other reservoirs around Phoenix’s periphery, mean to those whose other option is to crank up the AC- starting right about now. 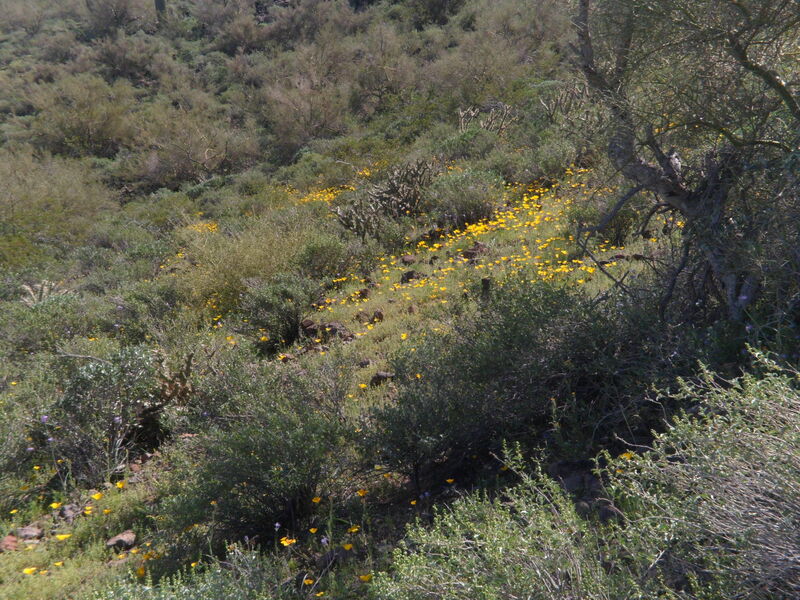 Wildflowers are also starting to grace the desert. This past weekend was the first burst. The water itself reminded me of the best of the Sea of Cortez- blue-green and clear. 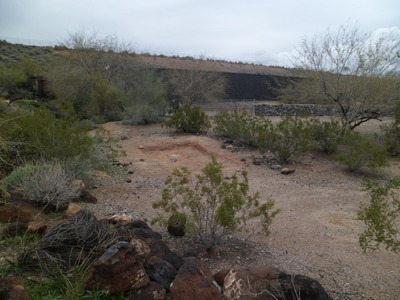 This section is at New Waddell Dam, on the southeast corner of the lake. 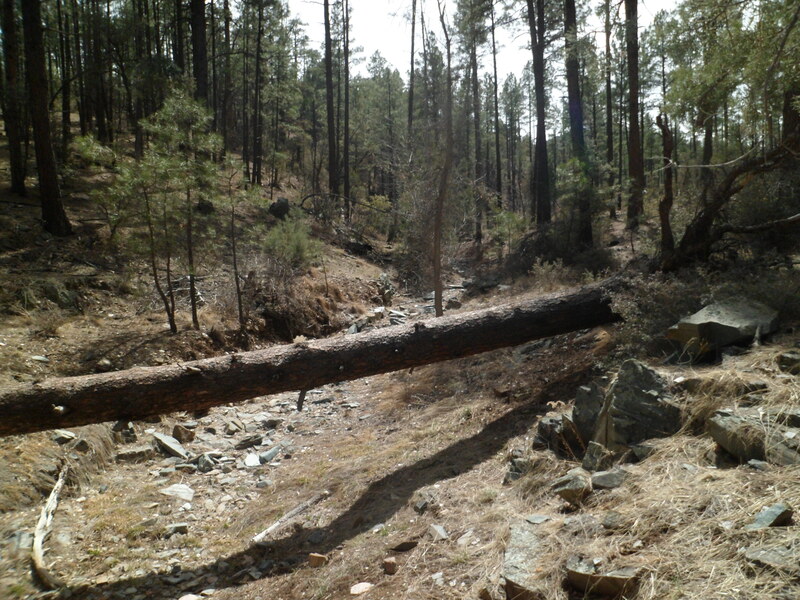 The flooding of the area took with it a large section of the upper Sonoran Desert, and some ranches. 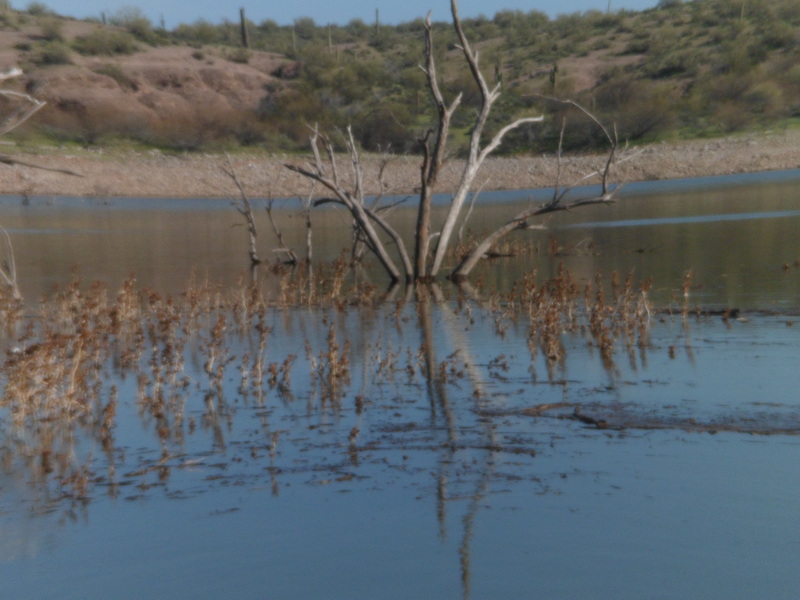 in contrast to the lush greenery that surrounds the lake, skeletal trees still jut out from the shallows of Lake Pleasant’s northern arms. 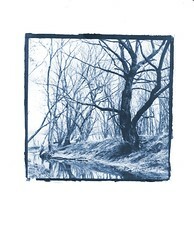 This scene is one of several at Castle Creek, on the northwest side of the lake. I know the local fish are happy here. The shad were jumping all over the place, while I sat and contemplated just how awesome this oasis is. 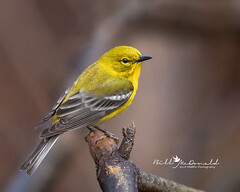 They did a fine job of staying away from the fishermen who were gathered atop Castle Creek Dam and along the creek’ s shore. 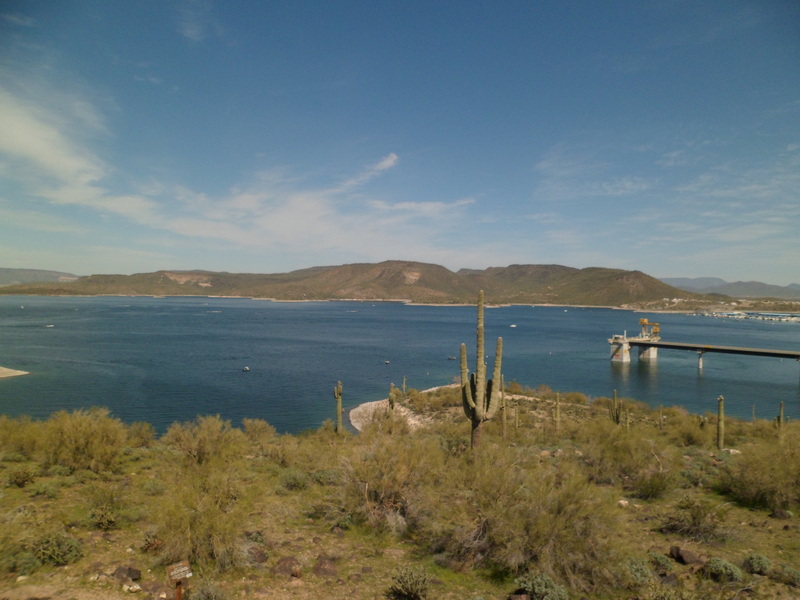 Unlike the lakes that grace Prescott’s forests and grasslands, Lake Pleasant cannot be circumnavigated on foot. A hiking trail did engage my attention from the Visitors’ Center to Park Headquarters, on the south shore. The north shore has separate hiking paths. 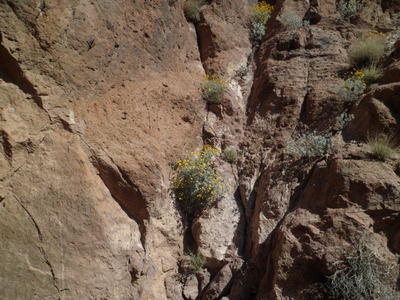 In between are sheer drop-offs and plenty of opportunities to bushwhack through the intervening desert. Somehow, I don’t think the local rattlers would take too kindly to it. 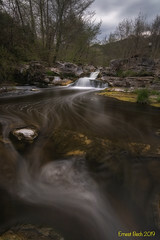 The second of several hikes I have taken during this Nineteen-Day Fast occurred last Friday. 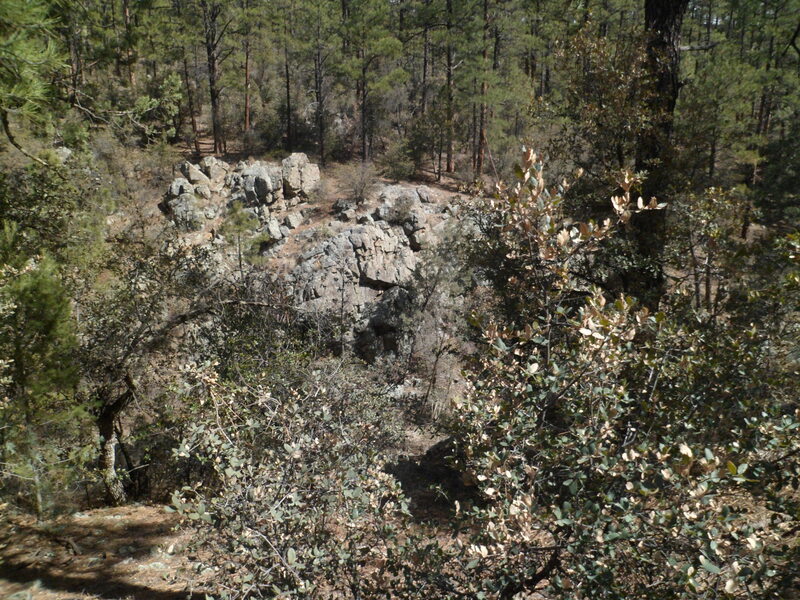 Between Lynx Lake and Walker Road, in Prescott National Forest, lies the Homestead Trail. It runs north to south, for 11 miles. 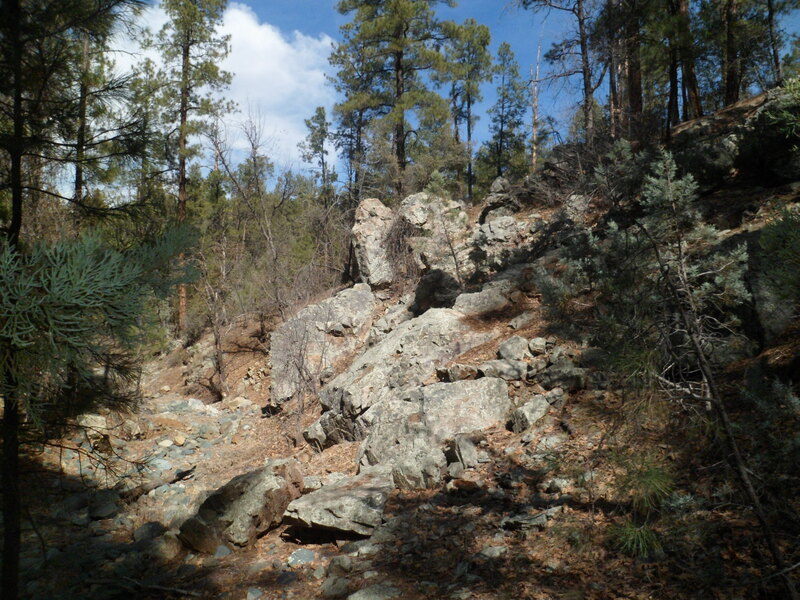 I have done the northernmost section, about two miles in the area near Salida Gulch, last Fall. 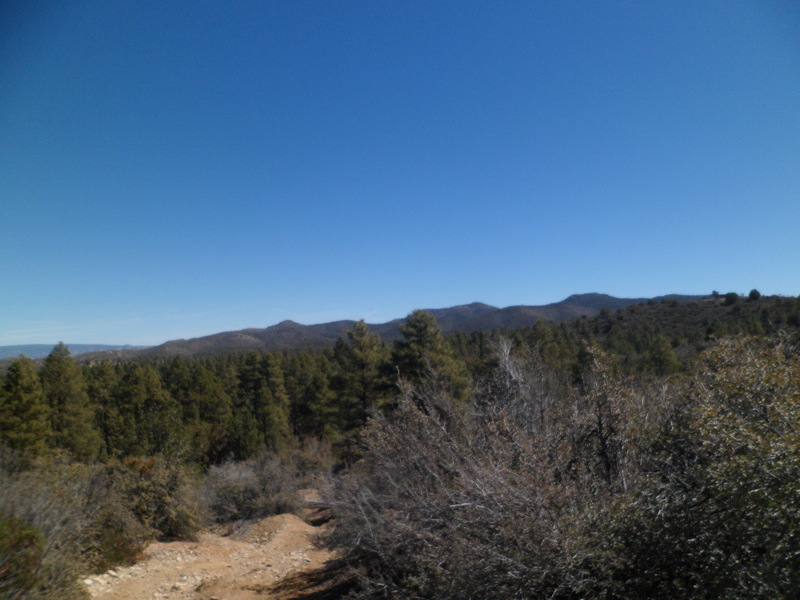 On this past Ides of March, though, I was focused on the trail’s midsection- about 2.5 miles each way, from a point paralleling the south shore of Lynx Lake to Smith Ravine. 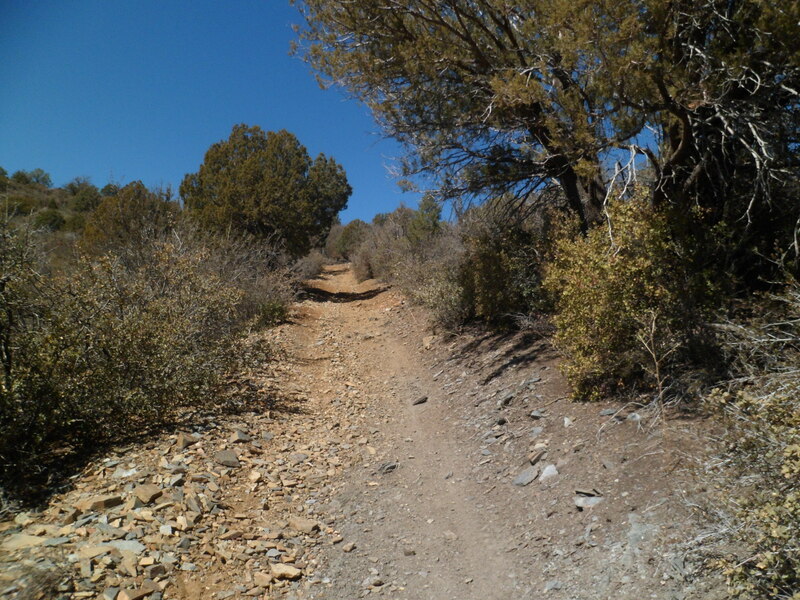 This part of the trail is rather flat and mellow for the first mile. Once past a couple of campgrounds, there is a downslope, then another mellow segment in a fairly dense pine forest. 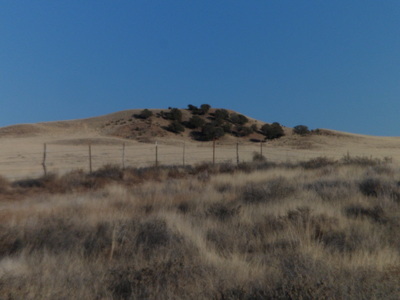 Then comes a livestock fence, with a hiker’s turnstile, followed by an upslope of about 1/2 mile. 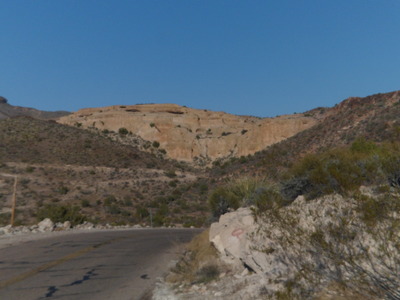 Smith Ravine appears to the left of the small hill’s summit and goes on for about two miles. I chose to stop and turn around, after about a quarter mile. The rest of the trail will most likely involve more people. Homestead Trail is a fine route for beginner hikers. It’s conventional wisdom that there are some things in this world that just don’t go together, like the above-mentioned substances. We Americans try anyway- beer and ice cream, ice cream with meat filling, dill pickle-flavoured potato chips, loud, swing jazz “lullabies”. Sometimes we get a serendipitous hit, other times- it’s Loserville. I have observed the Baha’i Fast, every March 2-20, since 1981. It has generally been a given that one should lie low, go easy on physical activity- unless it is necessary for one’s livelihood. Only once before, in 1992, did I let my wife talk me into a hike during the Fast. 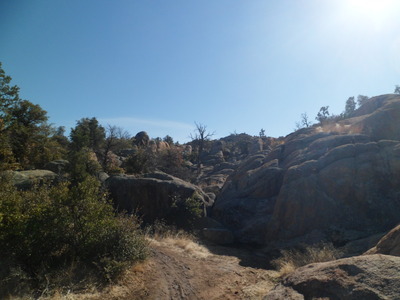 That was a leisurely walk up and down Prescott’s Thumb Butte. It hurt me none, but the following year, we both reverted to form. This year, I have kept up my work schedule, and been no worse for the wear. 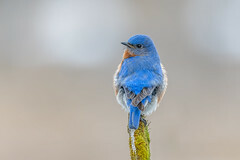 This week has been Spring Break, and I found myself getting a bit restless, after accomplishing all I wanted to do around the house- which was a considerable to-do list. So, I have devised the Fast Four-miler. That round trip distance is about as much as my body will do, without constant replenishing of its water supply. 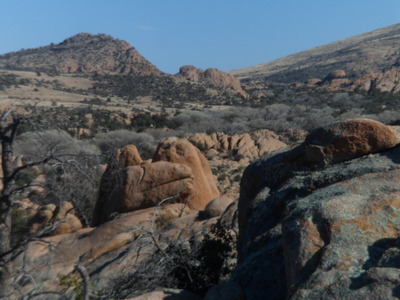 Sunday’s visit to the Chino Valley Peavine Trail was the first such outing. 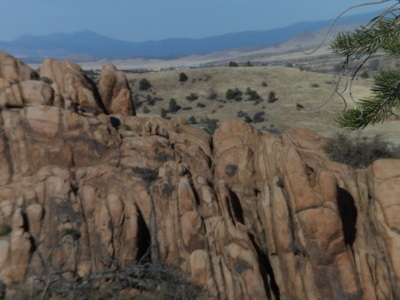 This afternoon, I made a more vigorous jaunt- on Seven-Mile Gulch Trail, in the Lynx Lake area. 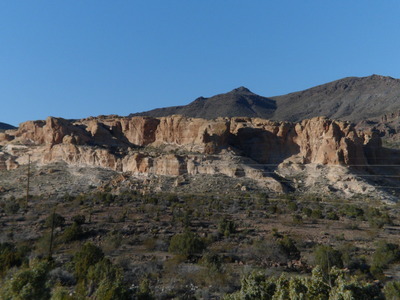 Seven-Mile is the name of the gulch and its nearby mountain. The actual round-trip is four and a half miles. The journey starts out easily enough. 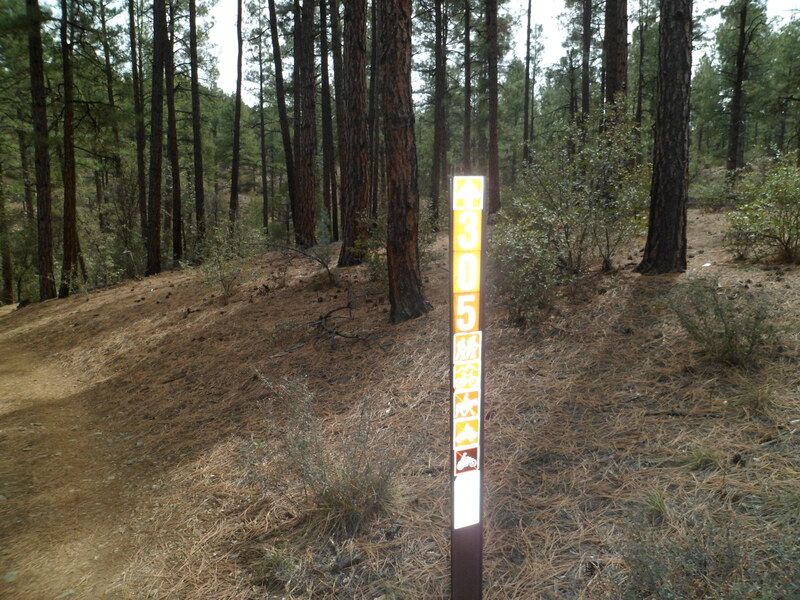 The first 1/3 mile or so is relatively flat, and goes through shaded ponderosa and alligator juniper country. 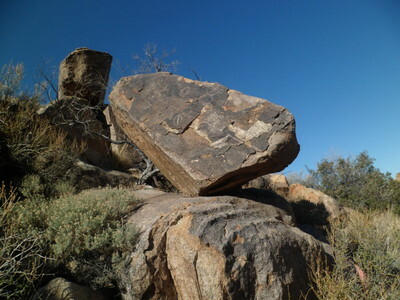 After that, this small rock formation indicates it’s time to turn right, and up the first of five inclines we go. 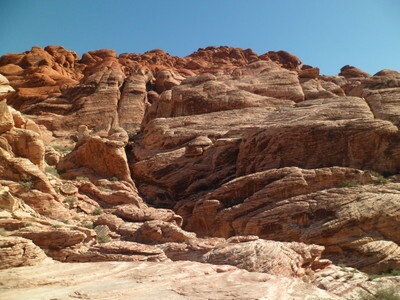 The first incline is wide, but slippery, and moderate in difficulty. This trail is exposed to the south, after the turn, meaning the afternoon sun can be an issue. I coped by soaking head and ball cap, after a fashion. 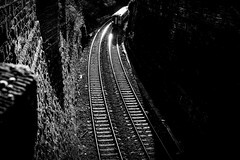 The first incline is about 1/4 mile long. 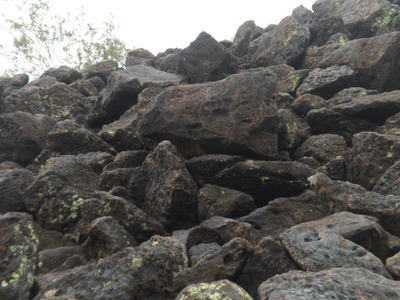 There are four more inclines, before the summit of Seven-Mile Mountain. 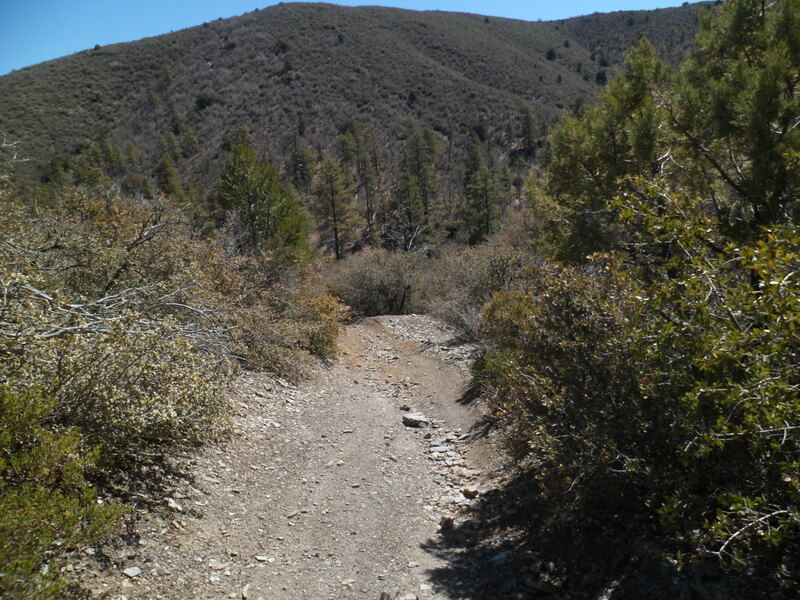 To the tenderfoot hiker, the third, and steepest, climb could very well feel like seven miles. 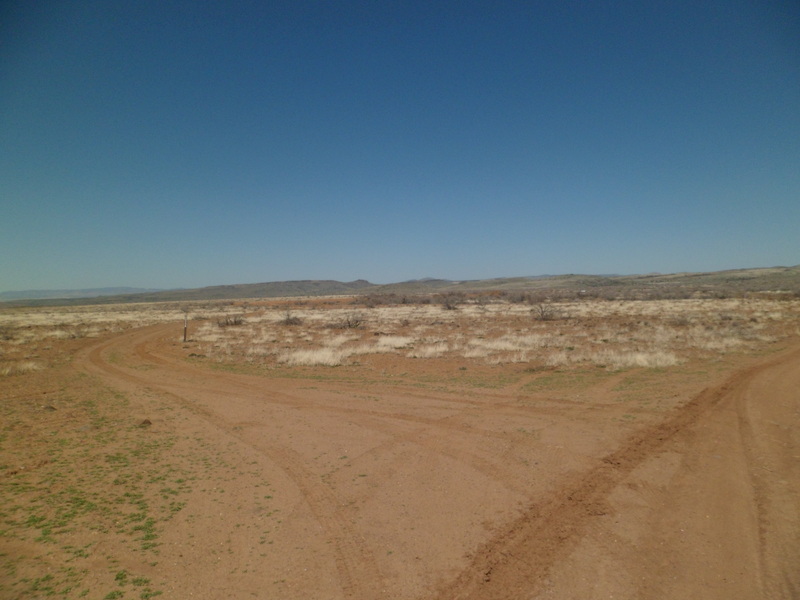 It’s actually 9/10 of a mile, but it is of Grand Canyon quality, without the switchbacks. Here are views of halfway up the Alley-Oop. First, looking back-then, what lies immediately ahead. Pacing oneself, though, makes this hike a satisfying venture, with fine panoramic views at each of the four ridges along the way, and from the summit itself. 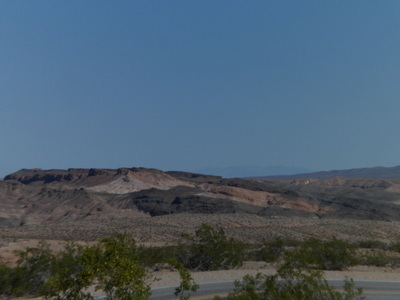 This view, of the Bradshaw Range, is from the second ridge. 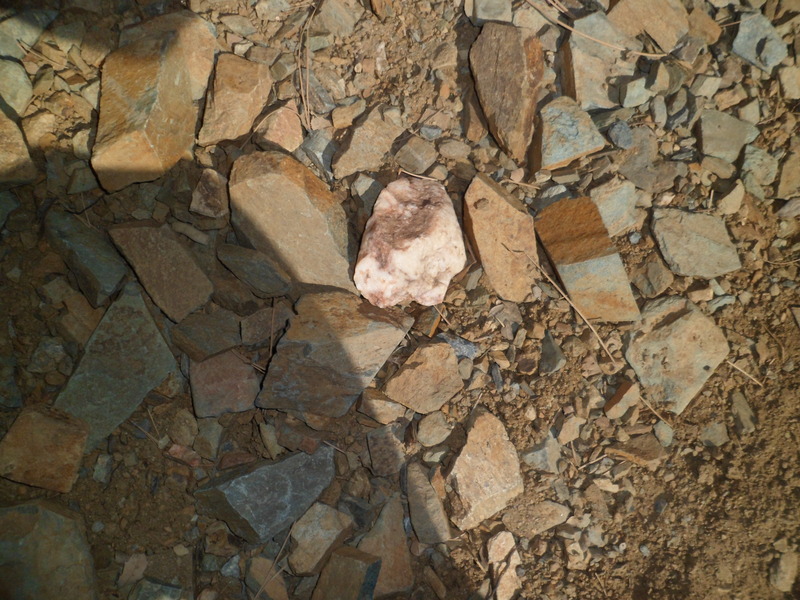 On the way down, at the end of the aforementioned third uphill, there lay another heart-shaped rock- this one of pink quartz. Minimal pain, followed by a very sweet gain. This stretch of March being the time of the Baha’i Fast, I don’t eat or drink between sunrise and sunset. There is still a lot of life to be lived, however, and so I headed down to Phoenix on Saturday morning, spending 40 minutes at Penny’s grave site, on the second anniversary of her funeral, placing a bouquet of roses and saying prayers. While I was there, three or four people were power-walking around the rows of the grave section. They looked rather other-worldly, and for all I know, they could BE from somewhere distant. I went about my own affairs, though, and noticed two small buds of a bean plant sticking out of the ground at the lower right corner of her stone. This, I take as a sign of blessing. The plant is probably going to be plucked by the groundskeepers, sooner or later, but it’s a nice sign, regardless. 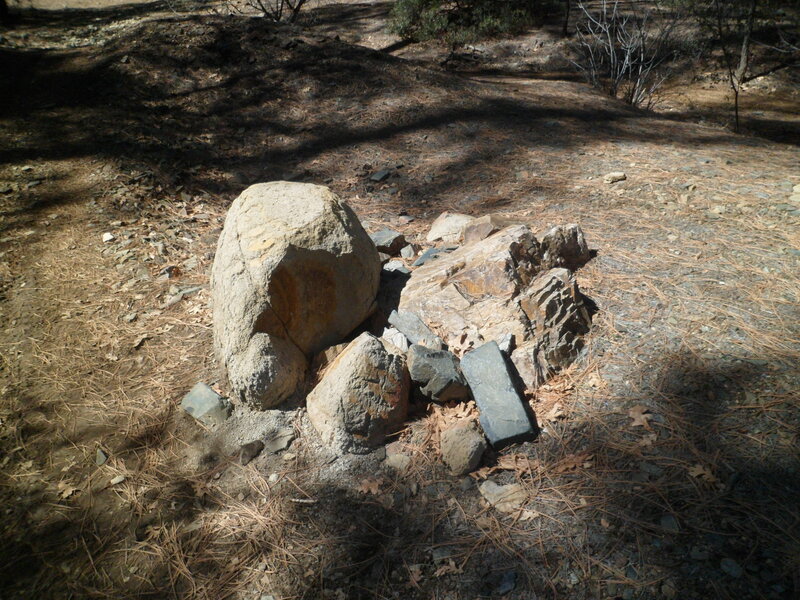 Afterward, I went over to Deer Valley Rock Art Center, about five miles west of the cemetery. We had talked a few times about going there, while she was in the flesh, but it never came to pass. 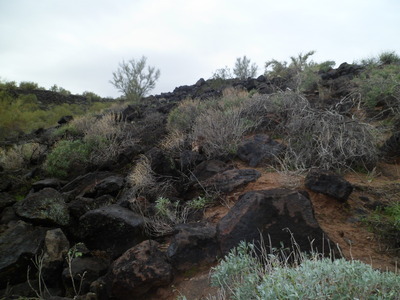 Three time periods’ worth of petroglyphs may be seen in the igneous rocks at this site: Archaic, Hohokam and Patayan. The “archaic” people were those of the Clovis and Fremont archaeological periods. 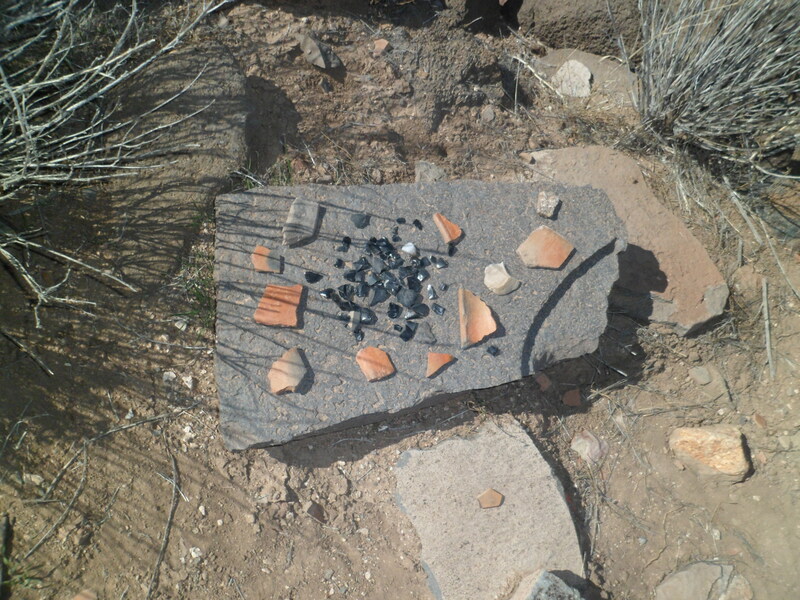 The Hohokam, you may remember, built the irrigation canals and attendant farming villages that are still preserved at Pueblo Grande in Phoenix and several other sites in central Arizona. 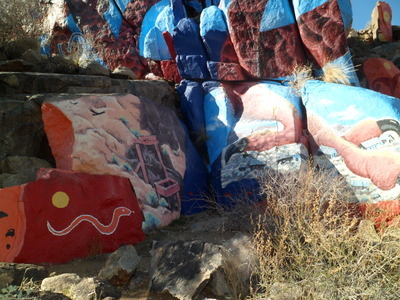 The Patayans mainly lived along the Colorado River, between what is now Bullhead City-Laughlin, AZ-NV and Yuma. 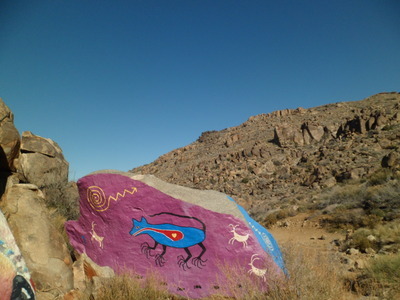 They are the people who left petroglyphs in places like the Cerbat Mountains, east of Kingman and Grasshopper Canyon, in southern Nevada. 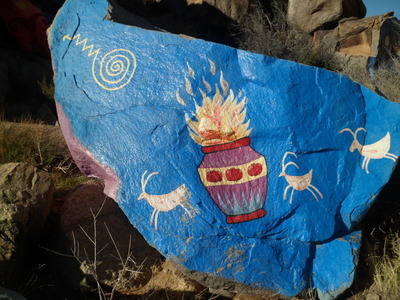 Here are some scenes of Deer Valley Rock Art Center, which is regarded as sacred by the Hualapai, Mohave, Yavapai, Maricopa, Pima and Tohono people. The photos may also be viewed, and clicked-on to enlarge, at my flickr site: www.flickr.com/lovingwanderer12. 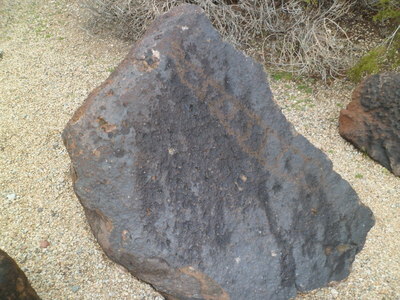 The area where the Rock Art Center is located is known as Hedgpeth Hills, after a farm family who lived here in the late 19th Century. 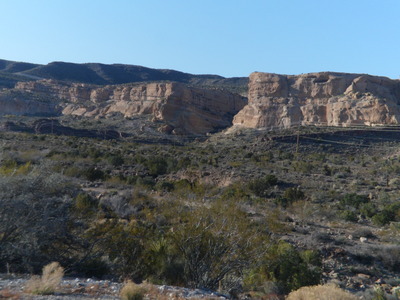 The tops of the hills are accessible only to registered members of the above-mentioned Indian nations, and to park staff. On Saturday night, I was back in Prescott, enjoying a Fast-breaker dinner of Persian cuisine, prepared by several of my Baha’i friends. Persian food is largely based on rice dishes, but includes lentils, oranges, persimmons, lamb and chicken. There is also a delicious eggplant dish, or two and, of course, baklava, in season. The cuisine started 2,800 years ago, so I am sure this list is just scratching the surface. Sunday afternoon, I felt the need to get out on the trail- any trail. As it was 4 PM, and I wanted to finish by sunset, Flat and easy was the choice. 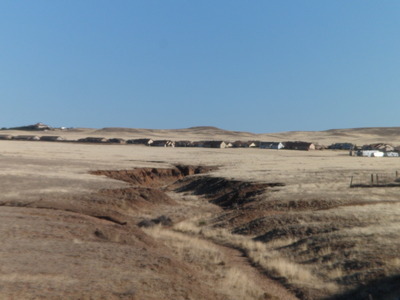 Peavine Trail’s northern extension, in Chino Valley, follows the old mining railbed on the east side of town. I walked two miles in and did an about-face. 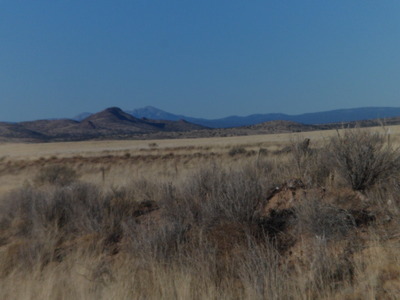 The area is badlands, ranch pasture and a few manzanita-covered hills. It does have lunar qualities, somewhat, but there are also fine views of mountains further afield. 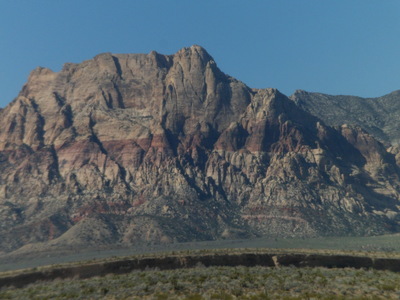 Below, is a view of St. Matthews Hill and Bill Williams Mountain. The remaining days of Spring Break will offer more outdoor adventures. Our weather will be fair, in the high 60’s and low 70’s, through St. Patrick’s Day. 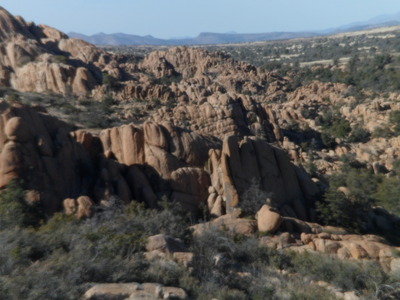 Last fall, I visited this area of Constellation Trail, built around the site of the 1959 crash of the US Air Force jet, Constellation, in Prescott’s Granite Dells area. 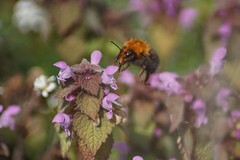 With yesterday being a heavenly day, I went back and took several photos of the area. 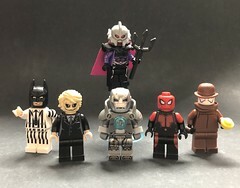 Here are six of those. 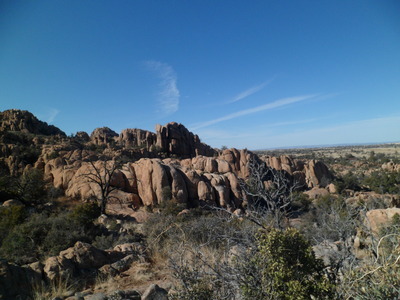 This sort of scene is de rigeur among the thousands of hoodoos in the Prescott area. 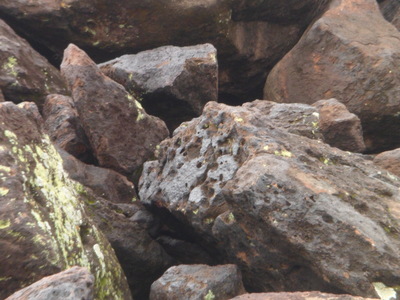 Boulders, of granite and of limestone, are the dominant geological feature in our neck of the woods. 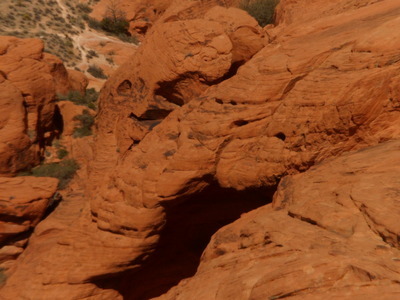 It all makes for hours of great hiking, clambering and making friends, for both people and dogs. 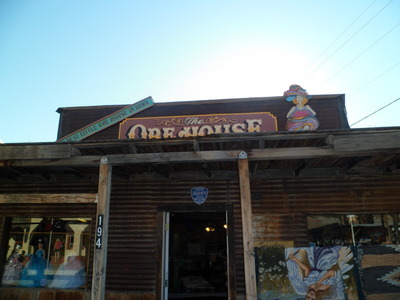 If Oatman, a preserved 19th Century town which still has an active mining operation nearby, were to tout itself as a north Arizona version of Bisbee- it’d be a stretch. 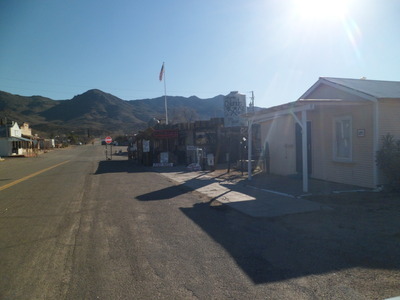 Oatman is, however, unique. 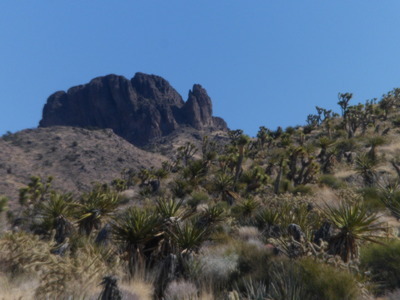 It has a bustling crowd of California and southern Nevada day-trippers, a few off-the-beaten track adventurers, who scout the nearby Black Mountains- which are quite interesting, in and of themselves, and a pack or two of semi-wild burros. The equines are descended from pack animals which came with northwest Arizona’s silver and uranium prospectors, in the late 1890’s. They are generally beloved in these parts, and loathed by a few “earth-firsters” who have somehow concluded the burros are a threat to native bighorn sheep- which stay in the mountains, while the burros are town dwellers and content themselves with the foothills. 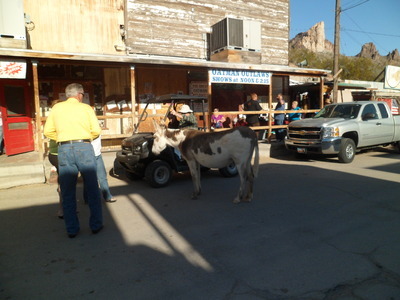 This past Presidents Day marked my second trip to Oatman. The last time I was here, in 1979, the road was rutted and potholes were predominant in the pavement. This time, the road was quite smooth, though there were several hairpin turns. 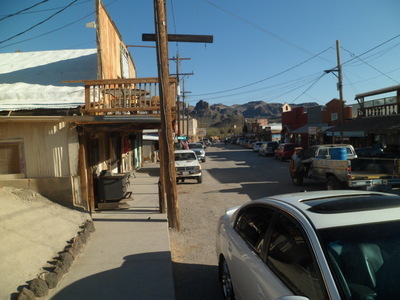 Oatman lies 28 miles west southwest of Kingman. In between are the awesome Black Mts. 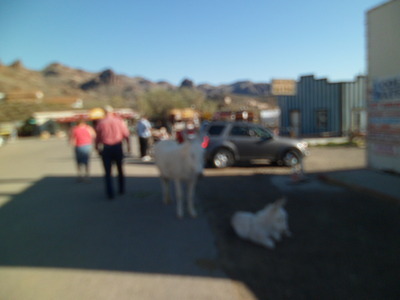 Oatman appears, rather suddenly, after 28 miles of Mohave goodness. The initial ambiance is of a misplaced ski chalet. Right around the corner, though, is the town’s official greeting. The main street would not be out of place in any of a number of Western mining towns; nor would the wry humour. The main attraction, though, are the town’s unofficial greeters. 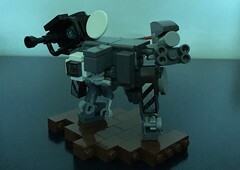 Excuse the last, grainy photo. I just couldn’t resist including Mama and Baby, even if they appear rather impressionistic. 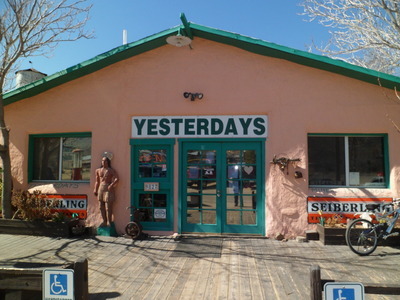 Dolan Springs, AZ is an unassuming little town- gateway to the Arizona shore of Lake Mead and the Hualapai Nation’s Grand Canyon Skywalk. It does, however, have a series of four or five interlinked trails, including one named for Susan B. Anthony, who, to the best of anyone’s knowledge, never visited these parts. No matter, the women of Dolan seem to be of the same independent spirit which led Ms. Anthony to achieve great things, which benefit all of us- male or female. 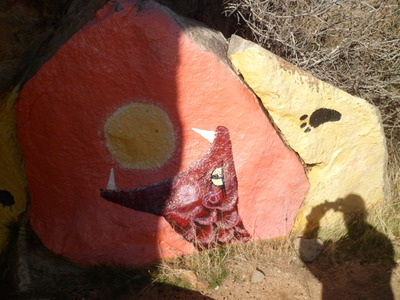 The Sue B. Loop goes for a bit more than two miles, in the Joshua tree forest, just east of Dolan’s business district and near the local elementary school. The day I visited was President’s Day, so things were slow. I was amazed, though, that I was the only person on the trail. I could hear people up in the Mt. 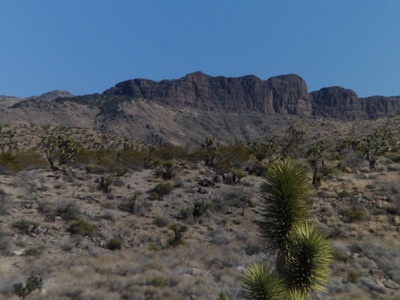 Tipton wilderness area, but that is another two or three miles to the southeast. That’s the beauty of the desert: Sound travels. 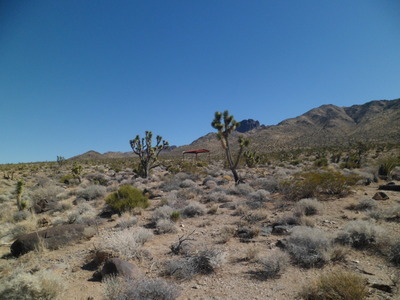 The Joshua tree, along with the yucca, is a staple of the Mohave Desert. Mt. 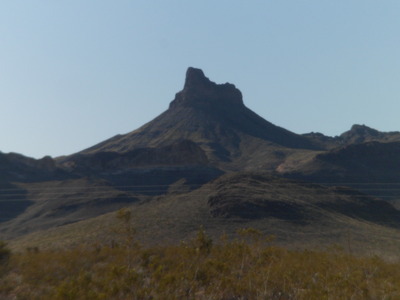 Mitten and Castle Rock, seen below, are the northernmost sentinels of the Cerbat Range. 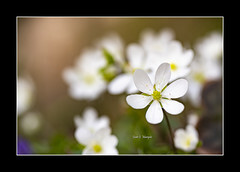 All things that grow, start small- whether human, animal, vegetable or even mineral. 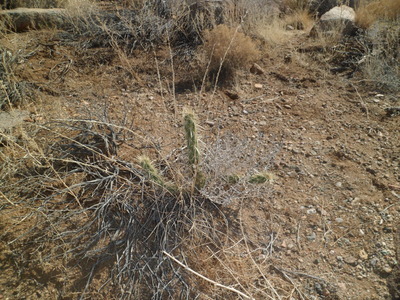 Here, a “baby” Teddy Bear cholla greeted me- from a safe distance. Whether on mild days, or in the blast-furnace of summer, the Sue B. 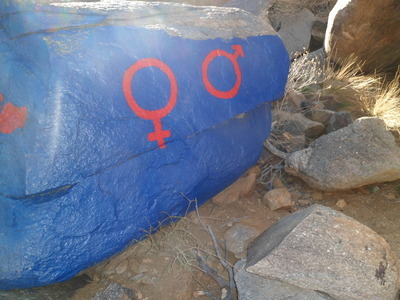 Trail keeps vigil over pleasant Dolan Springs. After a week of finally divesting myself of the house in Phoenix where so much of Penny’s care, and most of her final days, took place, I am getting back to unfinished business. Here in BruinLand, that means- oh, heck yeah, the Kingman trip of two weeks ago. 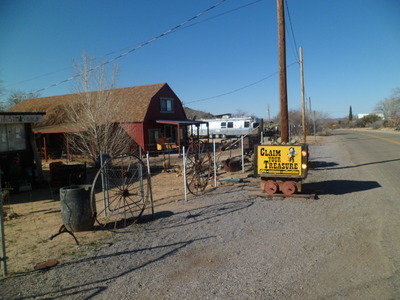 One of my most enduring memories will be the jaunt up to Chloride, an old mining town-about twelve miles northeast of Kingman, as the crow flies. 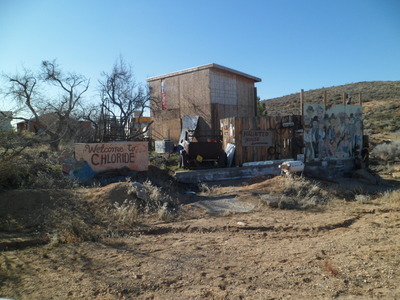 Chloride claims to be the oldest mining town in AZ, and about 300 people still hang out there, many hoping to still strike a bargain with the soil. 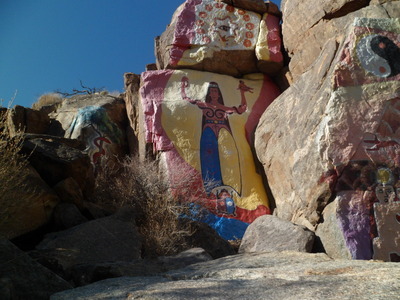 and commenced walking the 3/4 mile up to the murals, with their preceding pictographs and one more recent visitor’s autograph (thankfully, it is off in an obscure spot). 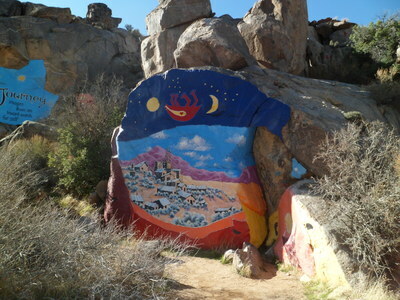 The murals themselves are a stunning contrast to what lies around them. At the end of the self-guided tour, lies the purpose of it all. After such a visual feast, it was time for lunch. I was not disappointed. Yesterday’s is one of those gems that can only be found by getting out and finding what’s out there. The portions are HUGE and the quality of the food matches the quantity. While I was waiting, the hostess showed me Roy Purcell’s gallery, in a side room of the restaurant. 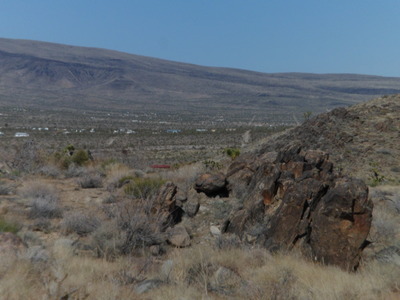 Chloride would have been worth the trip, in and of itself, but two more gems lay ahead: Dolan Springs and Oatman.